Life insurance companies have to mandatorily obtain their customers' Aadhaar numbers and link the same with their respective policies. This follows an amendment in the Prevention of Money Laundering Act (PMLA) Rules, 2017 in June of this year. The Insurance Regulatory and Development Authority of India (Irdai) had issued a circular making it mandatory for all policyholders to link their Aadhaar and PAN details to their insurance policies. Here's what the circular stated, "Central Government vide gazette notification dated 1st June 2017 notified the Prevention of Money-laundering (Maintenance of Records) Second Amendment Rules, 2017 making Aaadhar and PAN/Form 60 mandatory for availing financial services including Insurance and also for linking the existing policies with the same." All life insurance companies have made provisions, both offline and online, for their policyholders to link their policies and Aadhaar. Here's a look at how the policyholders of Life Insurance Corporation of India (LIC), the country's largest life insurance company, can link the two. In the process of linking the Aadhaar card number to the policy, you will be asked to furnish you PAN as well. • Make sure that your mobile number is updated in your Aadhaar card. If not, then get it updated before linking them. You will have to enter the mobile number as registered with UIDAI as the OTP generated will be sent to this number. 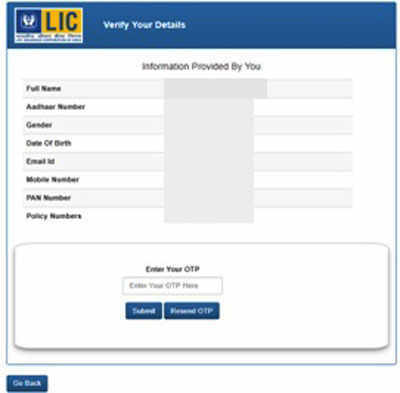 Step 1: Visit the LIC website, and on the homepage click on 'Link Aadhaar and PAN to policy'. Alternatively, click here to go directly and click on 'Proceed'. Step 2: Fill and submit the form after furnishing Aadhaar, PAN, email, and mobile number. Step 3: A message will be shown on the success of the registration for linkage. Step 4: After verification with UIDAI, an SMS or email confirmation will be sent to you. The verification may take few days. 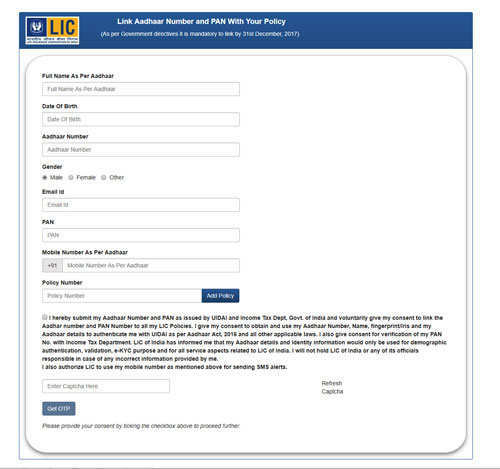 To get the form, either ask your agent to get one for you or download from the LIC website - On the homepage click on 'Download Aadhaar /PAN mandate'. The Form ( as on LIC website) opens up as a PDF document. After filling the form, you can submit this Aadhaar / PAN Mandate Form along with a self-attested copy of Aadhaar card and PAN Card / Form 60 at the nearest LIC Branch for linking of your Aadhaar / PAN number to your policies. While self-attesting, it's better to mention on the photocopies the purpose of furnishing the self-attested documents, i.e., for the purpose of linking of policies, in order to minimise the misuse, if any. After messages started floating around in social media regarding the linking process of LIC policies through SMS, LIC had recently come out with an advisory stating, "LIC of India informs the public and policyholders that no such message has been sent by LIC. Also no facility to link Aadhaar number to policies is available through SMS in LIC." To avoid any misuse of one's personal information make sure to go through your agent or visit the LIC office directly ..
To access online services on the LIC website, the insurer had already made it compulsory to furnish PAN or Aadhaar number. Policyholders looking to register for online services will have to either provide PAN or Aadhaar number in addition to other details such as policy number and date of birth.